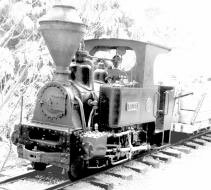 Paul Isenberg, owner of Lihue Plantation Company, encouraged George Wilcox to change from slow moving oxen and ox carts to locomotives for transport of the Grove Farm sugarcane to his Lihue mill. As a result, George purchased for his Grove Farm Plantation its first Baldwin locomotive in 1894 with Lihue Plantation always supplying the cane cars. We invite you to take a train ride back in time to when sugar coated the island and went from field to factory in small “sugar trains”. Grove Farm museum’s impressive collection of steam locomotives bridges cane haul methods from the earliest ox-drawn carts to steam driven locomotives to the use of gas powered cane trucks. This experience offers visitors the opportunity to learn of the sugar plantation transportation story where imagination led the movement of sugar cane. It demonstrates that during the industrial age, man’s inventiveness harnessed steam in order to move tons of cane as well as for use in other industrial machinery applications. In effect, this exhibit serves as Kauai’s museum of science and industry, where the scale, smell, sound and use of this equipment fill one’s senses and imagination with awe and inspiration. Since 1975 Grove Farm museum has provided free train rides at a monthly “fire-up” that began operating out of the Grove Farm Company’s Puhi roundhouse, where the locomotives have been stored since they were retired in 1957. In 1999 Grove Farm museum acquired a mile long section of the original Lihue Plantation railroad right-of-way adjacent to the historic Lihue sugar mill. After laying 1,800 feet of track, the monthly “fire-up” was moved there to provide the only authentic sugar plantation steam train experience in the state. This is a memorable experience for anyone, and an invaluable learning experience for students to comprehend the impact of sugar as a major influence in Kauai’s history and economy. Join us for a free train ride during our regularly scheduled “fire-up” on the second Thursday of each month between 10:00 a.m. and 2:00 p.m. Special arrangements for other days may be available for school groups and other organizations. 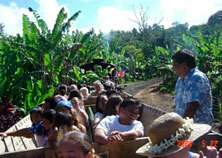 Please telephone (808)245-3202 to schedule a ride for your group on one of our historic sugar trains. Please note: The train rides are not part of the tour at Grove Farm museum. 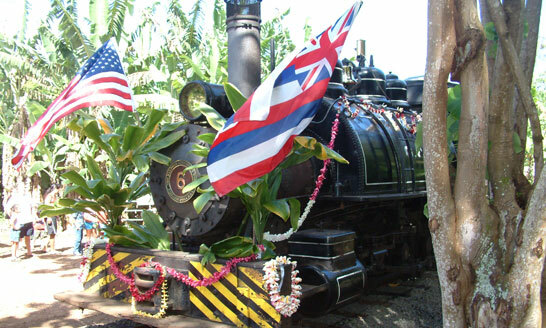 Paulo is the oldest surviving plantation locomotive in Hawaii. It was manufactured in Dusseldorf, Germany in 1887 at the Hohenzollern Works and shipped to Koloa Sugar Company, the first commercial sugar plantation in the kingdom of Hawaii, where it was in use until 1920. It was one of two firewood fueled steam locomotives used in the construction of the Waita Reservoir, built in the 1890s. Named for Paul Isenberg, the owner of Lihue Plantation and an officer of Koloa Sugar Company, this nineteenth-century locomotive weighs 10 tons, and could pull more than that weight. Paulo was restored in 1980. Wainiha, owned by McBryde Sugar Plantation, was named for the North Shore stream and could pull up to 50 cars. 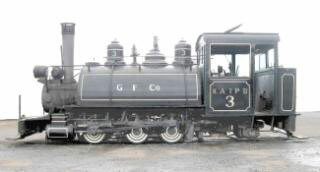 Sold to Lihue Plantation in 1932, Grove Farm Company bought the locomotive in 1947. It was in use until 1957 making Grove Farm Plantation the last to haul cane by steam. Miss Mabel Wilcox funded its restoration in 1975. Built in 1925 for the Hawaiian Sugar Company on Kauai’s westside, Kaipu was purchased by Grove Farm Company in 1945 and ran until 1953. It was named for one of George Wilcox’s first Chinese workers at Grove Farm and was restored to operating condition in 1982. Named for a Kauai westside stream, Wahiawa was built in 1921 for the Kauai Railway Company, was sold to McBryde Sugar Plantation in 1938 and to Grove Farm Company in 1947. Grove Farm Company donated these locomotives, which it had stored for twenty years, to Mabel Wilcox’s newly developed Grove Farm museum in 1975. Since that time, three of the four locomotives have been restored. The museum also constructed a replica flat car and three replica cane cars, which are outfitted with benches for passengers. Wainiha, Kaipu and Wahiawa were all built by the Baldwin Locomotive Works in Philadelphia, Pennsylvania and were originally coal or oil fueled. For more detailed information on Grove Farm Museum’s locomotives please click here.